If you designed the perfect age 55 community, where would it be and what would it look like? You’re smart to zero in on Central Florida because of this region’s world-renowned healthcare, sightseeing, and entertainment opportunities. But what about the community itself? What do you want to come home to every day? Or, better yet, what will you be able to enjoy without even leaving your neighborhood? At Hyde Park, a gated community of high-quality manufactured homes for adults 55 and older, we have you covered when it comes to enjoying an affordable active lifestyle. 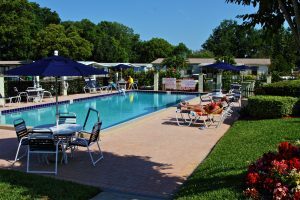 Our attractive age 55 community is located in quiet Winter Garden, just outside Orlando but within easy driving distance of that busy Central Florida tourist destination. And even if you don’t feel like driving, you can easily go by golf cart to the downtown historic district to enjoy its full calendar of special events. So stop dreaming about the ideal Central Florida 55 community lifestyle and take the first step toward making it a reality. Contact one of our Lifestyle Consultants today to schedule a tour of our charming community.